Geordie star Cheryl Cole is at the Baltic art gallery in Gateshead with the other three X Factor judges, Simon Cowell, Louis Walsh and new judge Mel B, as auditions arrive in the North East. X-Factor judges Simon Cowell and Cheryl Cole surprised staff at a Chinese takeaway in Newcastle. The pair stopped at Kwok Pao in Heaton after filming auditions for the ITV show at The Baltic on the Newcastle Gateshead Quayside. 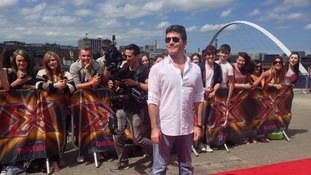 X-Factor judge Simon Cowell has given his verdict on Newcastle after the reality TV show held auditions in the city on Thursday. Newcastle was fantastic. And so was the talent. Apart from a few exceptions! Does Cheryl Cole ever come home to Newcastle? As Cheryl Cole walked the red carpet in Gateshead before judging X Factor auditions, we asked her how much time she normally spends in the North East. X Factor judge Cheryl Cole said she was glad to see auditions on Tyneside this year after local talent from Joe McElderry to James Arthur and Little Mix won the show. She never had chance to audition there herself. The X Factor's celebrity judges were in town to see the best of the talent from open auditions in the North East. How did Simon talk Cheryl into X Factor return? As Cheryl Cole made her return to the X Factor judging panel in the North East, we asked her what Simon Cowell said to convince her to do it. Simon Cowell: "I wouldn't let baby Eric audition"
Simon Cowell said he would not let his baby son Eric audition for the X Factor when he is older - unless he could sing. He also said fatherhood had not changed his life dramatically - and he still works as many hours as ever. Cheryl Cole has arrived to judge the X Factor auditions in the North East. She was greeted by fans on a red carpet outside the Sage Gateshead on the Quayside. Just 37 acts will perform in front of the X Factor's celebrity judging panel in Gateshead, without an audience, in a stripped-back audition process. Open auditions held already across the UK - including Gateshead and South Shields - have whittled down the number of contestants. Those remaining will audition in a room at the Baltic art gallery in front of a returning Simon Cowell and Cheryl Cole, veteran Louis Walsh, and new judge Mel B. In previous years, auditions have been in front of a large theatre audience, but this time, they will start in a small room, similar to the initial years of the show. New Xtra Factor presenter Sarah-Jane Crawford and regular host Dermot O'Leary were first celebrities to arrive at the North East auditions.